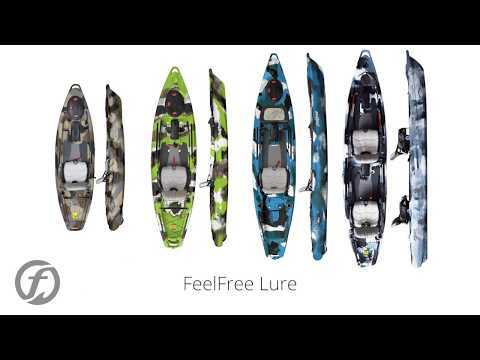 Feelfree Kayaks is taking kayak fishing to a new level in stability, comfort, and versatility with the Lure 10 Kayak. It is ideal for shorter trips on rivers and lakes and has all the features of the Lure 11.5. It comes standard with a variety of unique features including a removable multi-level, multi-position extra wide Gravity Seat, Feelfree's wheel in the keel, and Uni-Track system. The patent pending Feelfree Gravity Seat offers the widest range of seat heights which is adjusted with the simple function of a lever and is removable - the Feelfree Gravity Seat is the new high. The Lure's super-stable 36" wide hull paired with a padded standing platform gives you the option to paddle or cast in either the sitting or standing position whether fishing inland waters or wide open oceans - this kayak fears no water. I have not hit the water yet, but it arrived in perfect shape and I am very excited to try it out! Only taken the kayak out once. Super stable, seat is great, the wheel is the most innovative thing I've seen in a yak. The boat is slow and doesn't track well, but i knew that before I bought it. the lure 10 is super stable, love the seat and the wheel is the berries, makes moving this beast a breeze! Pros This is a good kayak that you can attach a lot of gear to. It's very stable and comfortable to fish from. I use a hook 5 fish finder with ease using a celblok on the rails. Cons This kayak moves slow in the water, the shape and width is great for fishing and standing, but comes a the price of speed. My biggest complaint with the 10 is there is no sonar pod, and the 10 won't be able to get the pedal drive that feel free is currently making. I would recommend getting the feel free 11.5 instead of the 10.
free lure 10 is a super stably kayak you can stand without fear to fall in water. This is my first Kayak and after careful research I went with the Lure 10'' A very stable kayak once you get used to it, learned rather quickly that when the gravity seat is fully extended you can tip rather easily if not careful..so take your time getting a feel for this kayak before moving your seat up to a higher setting, you will stay a bit dryer on your first day out. Love the compartments that hold all your gear and both keep water out even when the kayak is rolled.... Love the wheel on the back which makes transporting to a from the water a breeze, its a bit heavy at 70 pounds but nothing I can't handle loading into my pickup.. I am very happy with my purchase and the seat is extremely comfortable and the best on the market.. Nothing but high marks thus far on the Lure 10.. I highly recommend it for your fishing needs... For the price you can find no better Kayak .. Weather hasn't permitted me to take my lure out on the water just yet, but the boat is of top notch quality. Every detail about this kayak is perfect. Right away you can tell it's made with higher quality components than any kayak you'd buy at a big box store. It's constructed of very sturdy material. The gravity seat is awesome, and feels very comfortable. I love everything about it. I'm sure this is one of the best angling kayaks on the market for under 1k. This Feelfree Lure 10 (Camo) is a wonderful kayak. It's easy to load and unload in a small truck. I paddled for 3 miles up Pelahatchie Creek (water low, little current) and then back. It felt a little jittery at first but I quickly got used to it. The Gravity seat is very comfortable but with limited adjustment. Initially i felt like i was sitting too high even with the seat at its lowest point. Seat must be at lowest point or up above notch 6 to 10. This kayak paddles and tracks ok. I knew what I was getting before I ordered this boat. It fits my needs for a short compact kayak. Great for fishing or getting to out of the way hunting spots. I love it! But, my advise is to TRY BEFORE YOU BUY! If you paddle it before you purchase it there would be no need for nasty reviews! I live near Ross Barnett resevoir. I like to paddle and fish Pelahatchie Bay and Pelahatchie Creek. If you see me on the water I will gladly let you try out my kayak to see if you like it! I give this kayak 5 stars because I knew what I needed and was getting. Remer always PADDLE IT BEFORE YOU PURCHASE! Thanks for reading my review! This kayak is great but be sure you are able to handle its weight. It would be nice if the keel wheel was rubber or more extended. It gets stuck in sand or on a rocky way. The seat is great but I am struggling to get it down and up. Otherwise satisfied. This is my first experience with a kayak. I am 58 and over 225 lbs so I was looking for the most stable kayak I could find that also had a seat that would allow me to sit high and not have my legs stretch straight out. I am an amateur at kayaks but the feel free lure 100 seems like a solid piece of equipment. The one concern I have with the kayak is the stability. When the seat is in the full down position I feel comfortable rowing the kayak but when I stopped to fish in calm water on a small river/creek I did not feel comfortable turning around to get a drink of even grab my fishing rod from the holder. It felt unstable. When I raised the seat close to the highest position I felt like I would fall over if I moved. The videos on the internet did make me feel like I would experience this. I have already begun to construct some stabilizers to hopefully create a more stable feeling to fish from. Lure 10 love it!! Owned it two days and had it out both days. Very stable and easy to paddle!!! Absolutely love the gravity seat!! Just got the lure 10. Hands down best deal out there with ack package deal. It took 6 days to get to D.C. and the customer service kept me informed with every move. Deff recommend this kayak and this company. First of all ACK service is great, quick response, excellent knowledge of products. Shipment - also excellent experience. I got the kayak in 4 days (Naples, Florida). The driver helped me to carry the kayak 100 yards. The kayak was well packed and protected. This is my 3d fishing kayak. For inshore fishing, in Fort Myers/Naples/Marko Island area. What I liked: the seat is great (especially if you have back problems), the kayak is very stable, solid, a lot of room. It is heavy but 1 man can move it around with no problems. It is slow, but paddle 300-500 yards there is no problems. Make sure you have paddle 240-250 cm. Overall, I`m very happy with this kayak. Just received my 2nd Lure 10 from ACK. Arrived in 4 days from order in perfect condition. These are great fishing kayaks but you are not going to win any speed races with one. I hear some people are having trouble adjusting the seat down to the low position. The trick is to slightly lift up on the seat while pulling the release cord, then lower seat. I also noticed in the question section someone asked about scupper plugs and were told that they do not come with the yak. Both of mine came with 4 plugs which I put in the front deck area and under the seat. I don't use any on the two scup holes on the rear deck. The only thing I would change in the design is I wish the front console was slightly larger and had some type of gasket to make it water tight. I love the forward hatch as it is water tight and very easy to open and lock. As many have said this is a very stable and comfortable fishing platform and I have used my first one many times on the lakes and rivers of north Alabama. Good fishing everybody!!!! Before I begin my review on the product itself, let me do a little mini review for the shipping. The Kayak was shipped out 2 days after clicking the "confirm order" (or whatever it says) button, which is acceptable. However, It took 9 days from the status of "shipped" until it was delivered. The FAQ on the Austin Kayak website says it 'generally' takes 4-5 days for delivery, and a couple reviews have said it also took 4-5 days to deliver. I was disappointed that it took almost double the estimated delivery time, but I suppose that is just how it goes sometimes. I also had to drive to my local Home Depot to pick the Kayak up as the driver could not find my house for some reason. The packaging however had no tears/dings, it seemed to have been well taken care of during the shipment process. Now, on to the kayak itself. 1. Pre testing - before actually getting it out in the water to test it out, I went over the kayak physically. There were no scratches or dings or anything, nothing was missing, was in great condition. HOWEVER, the seat was as screwed up as it could be without being defective (which I am not 100% sure of yet). I spent 1-2 hours having to adjust, tighten/loosen and all around tweak every part of the seat to get the teeth (the gears that click and hold in place) to properly fit into the grooves on both sides of the seat. It did not, in any way shape or form, come ready to be sat in and used. It was a 2 hour job of realigning, adjusting, not only the bolts but also the wires that actually pull to lower the seat had to be re-tied by me. I had to do the job of the people who are supposed to make sure everything works before sending it off. A simple "let's try to raise/lower the seat a couple times to make sure it works before shipping it" would have saved me 2 hours of my free time at home fixing it. After taking it out for about 4 total hours of using it, the seat has not had any issues. The tweaks/adjustments I made seem to be working well and it seems that the seat was completely out of alignment/not adjusted at all, rather than it being "broken/defective". I will update this review if the seat breaks soon or starts screwing up again, but as of writing this review it is working great after putting my hard earned time into making it work properly and after hours of use, is holding up well. I do not expect anymore issues, but I will update this review if there are any. The first test - I took it out for about 25 minutes. It was not a fishing test, I didn't even have a pole with me, I just wanted to test the balance/seat/how well it controlled in the water. I have absolutely no issue whatsoever in how this Kayak handles/its balance/the seat (after working on it, as said above). It moves well (for being as wide as it is) and on my lake (which isn't a big lake, not small but not big by any means) it is fast enough to get me where I want to go without any headache or feeling of it being too slow. There are faster Kayaks on the market for sure, but you are buying this for stability/the ability to stand up and fish, and the comfortable seat, and all of that is fantastic. The second (and main) test - I spent 4 hours in it today, going up and down the local lake, fishing both sitting flush, sitting at the highest setting, and flipping jigs into heavy cover while standing. Every single position/cast felt right, appropriate, and after an hour or two I could not tell I was even on a Kayak while standing up, I could have been sitting in a nice flat bottom boat or some other larger craft where standing is simple and easy. As I said in the first test portion of the review, I had no issue with the speed/tracking on my lake, you might have an issue if you have huge lake or in an ocean, but on a medium sized lake it felt right as rain. Features - The rail system works as advertised, it's useful and when attatched with the Unibar Deluxe (which is just the unibar with 3 plates), It felt "full". What I mean by "full" is, if I were to go out without the unibar attatchment now, I will feel as if something is missing and that I am not getting the whole experience. Mounting two rod holders and my GOPRO mount to it (rods on the sides, GoPro in the middle), it felt perfectly balanced and right where I would want them. The bar (while the seat is up or if I am standing) does not get in the way of my casting, and I have more than enough leg room when sitting/paddling. The straps on the boat, the stand up strap, the padded floor, all the features you have probably seen many times while checking this Kayak out, are all very functional and very useful and intelligently designed/implemented. Overall, the kayak itself is a fantastic piece of equipment for anyone looking to go kayak fishing in a medium/small lake, who intends to stand up a lot and make use of its features. However, the shipping speed was slightly disappointing and having to work on the seat for 2 hours to get it to function properly was absolute nonsense. What I want to give it is a 4.5/5, to take off .5 of the review for the nonsense regarding the seat. However, there is no .5 system that I can tell. I cannot just let the seat go, that is absolutely ridiculous, a consumer should not under any circumstance have to do the job of the comapny that sends it. I should not have had to put 2 hours of maintenance into the kayak before even being able to put it in water. So, it will be 4/5 stars as I cannot do 4.5. Lure 10- one word awesome!!!! 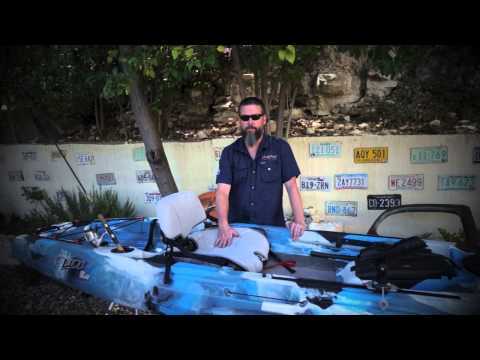 Great kayak for fishing, wide enough to stand, seat is very comfortable!!! Will never switch!!! Awesome job Feel Free!!!! This kayak is extremely well made. Seat is very comfortable, I find myself sitting in the highest position most of the time. Standing is very easy and stable. I ended up getting a 250cm paddle and happy I did, extra length helps since this is 36" wide, and paddle while standing is a breeze. My friend has the 11.5 and after seeing that, I was set on the lure. Got the 10 because of storage space issues, but not disappointed I did. Seems like the bow and stern are just a bit shorter, deck is the same size as the 11.5. Love fishing off it just as much as I do cruising slowly thru streams and rivers. Arrived quickly and no damage what so ever. ONLY con in my opinion are; lack of an actual cup holder. I use the nets on the sides of the seat, but have smashed cans when lowering the seat forgetting a can is there. Finally took my kayak out. The wind was 15 mph., normally would not go fishing in that kind of wind but I wanted to test it out to see how it handled. This kayak actually did what I expected, it handled very well in small waves and a lot of wind. Was able to stand up in it, and paddle fairly easy. Didn't have any trouble keeping in on course however with that wind it was a slow paddle, however I didn't expect it to be fast which is fine for me. I love the seat, very comfortable, however I will have to get used to lowering the seat. They make it look a lot easier on the video, but I am sure with practice it will get easier. The seat in the highest position is awesome for casting, and you can still paddle without feeling like your going to tip over. Can't wait for my next outing in calmer conditions. I would recommend this to anyone. Just got the kayak, received it within 4 day's. ACK prepared this kayak for shipping very well. No damage. I can't wait to take it out. My wife liked it so much she sold her old town fishing kayak and ordered one for herself. when I take it out next week I will write another review on how it handle. I know a few reviews state it is hard to keep it running true. However I have been fishing out of a 16ft canoe, usually by myself. So this unit ought to be a breeze for me. Especially in the wind. Can not wait to try it out. The Gravity seat is amazing, very heavy duty. Will let you know how it is in the water in 1 week. 5-star because it does what it was meant to do very well and meets my particular needs. I had my new Lure 10 out for the 1st time this past weekend in the FL Keys and I can say it's a fabulous fishing platform. This is the 4th kayak that I have owned and it is different from the others. It is not a fast, good tracking, touring kayak. It doesn't try to be that. It is a very wide stable fishing platform. Fishing in it is not like fishing in a kayak. It's like fishing in a small skiff. I paddled to a location, raised the seat, anchored and fished in comfort with great ability to see down into the water. I would fish a spot, pull the anchor up, paddle or drift to a new spot, and drop the hook again without lowering the seat. Later I was in the shallow stuff and I stood and used a pole to push myself around and work on sight fishing. Fantastic. You see so much more from a standing position. I am 5'9" and weigh 178lbs, and standing up is a piece of cake. I have a 34ft trawler style boat, so I am mothershipping the kayak and 10 ft was a limit for me. I would suggest the 11.5 for anyone not having that limitation. The extra length should help a bit with speed and tracking. A rudder is an option on the 11.5 also. Heading to the Bahamas soon and can't wait to try it out bonefishing! The feel free lure 10 is a great boat, I've had it out 3 times this month. Very stable and comfortable. The seat is amazing and is what sold me. It is a little slow so for those hard chargers, and big water you might not be happy with it. But other than that for my needs if been great. I give it for stars because of it's slow tracking. I was looking for a kayak with stability since I have a condition where balance can be an issue. The wide track and the wheel in the keel is what made me land on the lure. I ordered it in the new orange camo color. I love this color. I took it to the river the very next day after I got it. It handles great. It can be heavy to put on the top of my wrangler. But the gravity seat does come out very easily and then it is easier to car top. I did have trouble with the gravity seat not wanting to go back down once raised up. I called the ACK team and was told to put some elbow grease on it. It loosened up and works great now. The delivery was less than a week to Alabama. It also came 18 wheeler to my house. Great guys to order from. This is my first kayak although I did test drive many. The seat is very comfy. Now I just need for it to quit raining so I can get back on the water. This is my first Kayak. I have yet to use it on the river. but this thing is amazing!! I kind of feel like i should of gotten the 11.5 footer. but i do like the weight of this. very, very stable!! i can see where the other reviewer was saying it paddles like a doughnut, from being as short as it is. but thats when you powerhouse your strokes. i believe the triple hull and wheel also cause drag. but you cant win in all categories. when you have something this stable and 100% perfectly made. good job guys!! will be buying products during the winter to gear up for summer. First Let me say, as everyone else has, ACK customer service is TOP NOTCH! The Feelfree Lure 10 is a fishing machine. I was concerned with it being difficult to paddle due to it's width but I was wrong, it paddles easily, its not super fast but a joy to paddle to and fro your next spot to stand and cast. The gravity seat is also very comfortable and easy to adjust on the fly. Paddling all day with this boat is a pleasure, the roomy cockpit is a joy to fish from providing room to stand and cast as well as plenty of leg room. The boat is a bit heavy to lift for me with the seat installed, but with the seat removed it is a breeze to load on top of my car. I am in love with this boat and would recommend to anyone looking for a super stable well made kayak to fish from. And as I mentioned earlier ACK customer service is the best. Thank You! Really nice Kayak and an excellent fishing platform. Only two things I can give a less than ideal rating for is the gravity seat and the weight of the vessel. The gravity seat is VERY sketchy operating and I don't recommend sitting on it at any of the supposedly 10 positions other than flush. I can't count how many times I've sat down and the seat disengaged unexpectedly. Also the kayak is VERY heavy and awkward to lift and if you are planning on transporting it via car-top you will need to build up your strength or have a friend assist. The gravity seat will usually fully extend while trying to lift it and this makes it even more difficult. Feel Free needs to completely scrap the gravity seat and offer perhaps a hydraulic seat instead considering the high price point and perhaps consider some lighter weight materials for a 5 star review. my friend bought one for his daughter and i was curious about trying it out. well it was not was i expected at all. this is most comparable to a donut. it tracks like you would think a donut tracks. its paddles as fast as you would believe a donut would. if you are not constantly paddling it will turn one way or the other. so if you want a rather large slow donut to paddle around this is the kayak for you. ive owned a tarpon 120, a tribe 11.5, a old town vapor 10. currently own a pa14 and a slayer 12 all of which track 10 times better then this lure 10. i hope this review will save someone the disappointment that my friends daughter had on her kayak purchase. I received my Lure 10 from Austim Kayak and it was well packaged. The fit and finish of the kayak was excellent, I happened to have an Ascend D10T with me to compare the lure to and their was no comparison, it is clear to see where the extra money goes. It goes without saying at this point but the seat is excellent. I really wanted this kayak for stand up fishing and I did but I found myself fishing primarily in the low position. The kayak is very stable and tracks well enough for bass fishing. There are some nice features, the front hatch is very nice and the side handles allow me to car top my kayak solo. The wheel in the keel is a nice feature and saves you $70 on a cart, however when using is, the yak acts like a wheel barrow and is tippy but it does the job. I have taken it out twice now and I couldn't be happier. I highly recommend this kayak to anyone wanting to kayak fish, you won't be disappointed. I've had the Lure 10 out a few times now and absolutely love it! It has all the features I was looking for- elevated seat, built in rod holders, wheel in the keel, etc. Very stable kayak and easy to haul. My kayak just arrived, well packaged and without a blemish. The shipping was super fast and easy. The quality and workmanship on this boat is obvious from the moment you take off the wrapper. This is one well built machine. First impression of the seat is this thing will go all weekend not just all day. Feel free really put attention to every detail. These guys must be fisherman first, kayak builders to pay for the addiction. Cant wait to put this thing in the water. If this thing handles half as good as it looks.....fish on!!!!! Austin kayak rocks as well. Superior customer service, shipping, people..... You'll guys really know how to treat a customer. Thank you. A: The gravity seat is 16 lbs. The Lure 10 is 69 lbs with the seat. Without the seat the Lure 10 hull itself weighs 53 lbs. Q: Would this be a good choice for small creeks and rivers and is there any better kayaks I should look at? A: This kayak will be great for calm small creeks and rivers, but in a higher intensity body of water I would recommend a sit inside kayak with a spray skirt, although I will say the Lure 10 should perform well in terms of staying upright and having a high maneuverability. Q: I know the Lure 10 is not rudder ready but would it be possible to put one on. A: Thanks for the question! 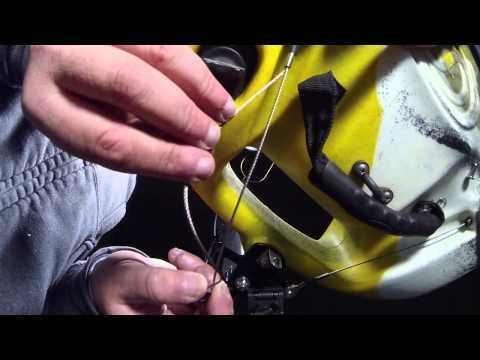 There is a bracket that we would need to get from Feelfree that they have made to attach a rudder to the Lure's that are not capable to hold the drop pin. Q: Is there an option to add rudder system on lure 10? A: Hey there, thanks for the question! The Lure 10 does not come rudder-ready. A: Yes you can, you will just need to sign up with Affirm when placing your order. A: Unfortunately you can not add a pedal drive to the Lure 10 because it does not have the removable hatch, and you can not put a rudder on it. The shortest Lure you can add a pedal drive to is going to be the Lure 11.5. Q: does the lure 10 come with an assist strap? product video says yes; a reply from ack says no. Q: Can you attach a stand up strap? Q: Is there a way to attach an anchor onto here? A: Technically, yes you could attach an anchor system to it, you just might have to attach it off to the side based on the shape of the rear of the kayak. Q: Is the feel free 10' kayak good for standing? A: The Feelfree Lure 10' is 36 inches wide, making it very stable. Great for standing up to sight cast or even just to stretch your legs during a long day on the water. A: The Feelfree Lure does come with 4 scupper plugs. There are 6 holes in the kayak, but we recommend leaving a few open. Q: What are the internal dimensions of the rear tank well? wondering if I'd be able to fit a FeelFree 45 cooler in the area, a 25 is too small for the lengthy trips we take. Thanks! A: 36 inches long, 18 inches wide. Hope this helps. Q: Will the Yak Attack Black Pak fit in the back of this kayak? Q: Does this have the electronics pod or are you still selling the older model? A: Hi, Thank you for the question. The Lure is going to have the center storage dash. We do not have any prior year models. Just the most current models. Q: How many scupper plugs will I need to buy? A: You will need 6 scupper stoppers for this kayak. Q: Does the Lure 10 come with any scupper plugs or do I need to purchase them separately? Q: Can you get the Feelfree kayak 250 paddle if I order the lure 10? A: Yes, we can order any product form our vendors even if its not listed on the site. Q: Can you order a lure 10 with a rudder installed? A: Unfortunately you cannot. This option is not available for this kayak with ACK. Although the 11.4 and 13.5 do have this option. Q: What are the dimensions inside the smaller hatch on the feel free lure 10? A: The internal area is not a perfect rectangle, but the approximate dimensions are 13.5" long, 6.5" wide and 5.5" deep.